Rich Christian, Poor Christian: What's Your First Symphony? The largest work any music composer can ever compose is a symphony. When I say "symphony," I'm referring to an extended piece of music of sophisticated structure, usually for orchestra [Source: Wiktionary]. Depending on the composer and what musical era he was from, a typical symphony with 4-5 individual movements can last from 20 minutes to over an hour and a half! We're talking about a major piece of music that for some composers took years to write, and they typically don't just write only one in their lifetime. They write several. They have poured their hearts and souls into these musical masterpieces. All of the major symphony composers started with a first symphony. Haydn, Mozart, Beethoven, Brahms, Bruckner, Sibelius, Mahler, and a host of others all started with one work, then wrote another, and then another. The interesting point here is that for many of these composers, their first symphonies were really nothing to write home about. For many, they were solid works of music that were a starting point to learn and grow as a symphony writer. Mozart could not have written his "Great" Symphony No. 40, without first writing his Symphony No. 1 and then the other 38 symphonies that would follow. 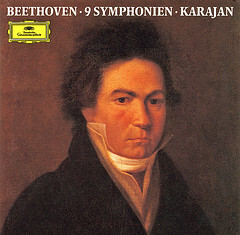 Beethoven's great "Choral" Symphony, his ninth, could not have been written until he was able to get the first one down on paper, as well as the other 7 symphonies that would follow. Each one of these symphony composers had to start with their first big symphonic work, make mistakes, learn from the experience, and then move on to a second, a third, and so on. No matter what our calling in life is, there will always be a beginning point from which we must start. For the pastor, there has to be the first sermon that must be written and preached. For the author, there must be a first book that is slaved over and published. For the blogger, there must be a first post that is published online. For the web designer, there must be a first website that is designed, programmed, and placed online. Whatever we do in life, we have to start somewhere. Here's the scary part, though. Starting the process of any big task can be a paralyzing event. Because the end product seems so huge, then the process seems unbelievable difficult. We have a tendency to just give up before we've even truly begun. The composers, the writers, or the designers who accomplished their first big work, though, started with one note, one word, or one sketch and built something from scratch. They simply took one small step, then another, and another until the work was finished. Was their very first major work a complete success? Maybe and maybe not, but they learned from the experience in order to step out and create other great masterpieces. They didn't procrastinate. They took massive action. So, what's your first symphony? What's the one BIG thing you have burning in your soul to accomplish? Have you chunked it down into smaller action steps to make the desired outcome more manageable? Are you taking some action, however small it might be, in order to get you closer to your goal. Acknowledge that your first one may not be your best work and do it anyway. Grow as a person. Learn from the process. Get outside your comfort zone and start writing that "first symphony."